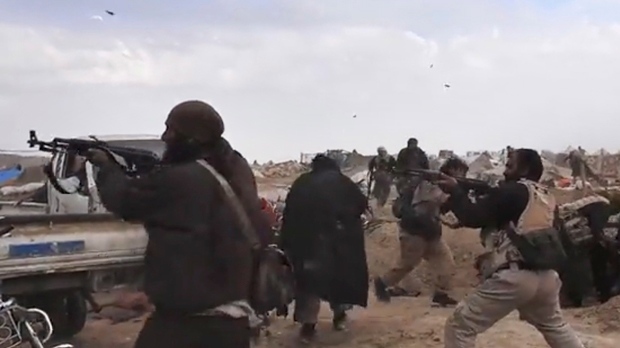 BAGHOUZ, Syria -- U.S.-backed Syrian forces on Tuesday seized control of an encampment held by the Islamic State group in eastern Syria, after hundreds of militants surrendered overnight, a spokesman said, signalling the group's collapse after months of stiff resistance. A group of suspects involved in a January bombing that killed four Americans in northern Syria were among militants captured by the Kurdish-led forces. The battle for Baghouz has dragged on for weeks -- and the encampment has proven a major battleground, with tents covering foxholes and underground tunnels. The siege has also been slowed by the unexpectedly large number of civilians in Baghouz, most of them families of IS members. Over past weeks they have been flowing out, exhausted, hungry and often wounded. The sheer number who emerged -- nearly 30,000 since early January according to Kurdish officials -- took the Kurdish-led SDF by surprise. Five trucks hauling 10 trailers full of people were seen coming out of Baghouz. A child could be heard wailing from inside one of them. At least 100 people, nearly all of them children, have died in the truck trips from Baghouz on the way to a camp in northern Syria, or soon after reaching it, according to the International Rescue Committee -- a sign of how miserable conditions were inside Baghouz during the siege as supplies ran out.